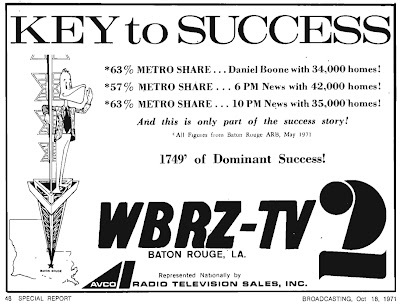 In this vintage trade ad for Channel 2 in Baton Rouge, WBRZ, being smothered in crude oil would seem to be the least of Pierre the Pelican's problems. As a matter of fact, that 100 kilowatts of radio-frequency excitement he's hangin' onto is about to wipe the smile right off his beak. If you're laughing right now, you just may be a geek. And if, in the lede, you recognized the wording WBRZ used in every on-air legal identification way back when, you may be a double-plus geek. Me? I would be your leader.